The story of the first round of Ukraine’s presidential election was the success of comedian Volodymyr Zelensky, who topped the vote and will face off against incumbent President Petro Poroshenko in the second round. Max Bader writes that while much of the international media coverage has portrayed Zelensky’s candidacy as a symptom of an immature political system, the real takeaway is that the first round was more open and fair than any previous election in the country, strengthening Ukraine’s status as a European democracy. The first round of Ukraine’s presidential election took place on 31 March, with a crowded field of thirty-nine diverse candidates. The election has cast a light on corruption among the country’s political class, the influence of oligarchs in politics, and the potential impact of disinformation. From a more optimistic standpoint, however, it has also shown that Ukraine’s democracy is becoming more mature and its politics less ‘post-Soviet’. The two candidates with the biggest vote share in the first round, incumbent President, Petro Poroshenko, and the country’s most popular comedian, Volodymyr Zelensky, will face off on 21 April in the second round. The race has been remarkably open. Zelensky is not just a new face in Ukrainian politics, he is also not tied to existing political forces. From the moment he hinted at running for President, there were rumours that he represents the interests of the oligarch Ihor Kolomoyskyi. While it is clear that there are links between Kolomoyskyi and Zelensky, there is little at the moment to suggest that Zelensky would act as Kolomoyskyi’s puppet once in office. The race has also been reasonably fair. There have been some reports of the misuse of state resources in favor or Poroshenko’s campaign, but there is little evidence that the misuse amounts to a coordinated effort. Perhaps the dirtiest trick in this election has been the candidacy of Yuriy Volodymyrovych Tymoshenko, a backbencher in the national parliament whose name is almost indistinguishable from that of Yulia Volodymyrovna Tymoshenko, one of the leading candidates. It seems likely that almost all of the 117,711 people who voted for Yuriy Tymoshenko actually intended to vote for his better-known namesake, but the lost votes were too few to cost Yulia Tymoshenko the second round. Election day itself was evaluated favourably by both domestic and international observers. Observers from the OSCE-led international election observation mission, for example, positively assessed the voting process in 99% of polling stations visited. During the election campaign there was substantial concern over Russian efforts to influence the election through disinformation. What Russian disinformation there was during the campaign, however, did not penetrate deeply into the mainstream Ukrainian media. Disinformation was also largely absent from opinion polling. The polls that were published in the days and weeks before the election, as well as the exit-polls that were published on election night, have proven to be fairly accurate. The main exception in this regard has been Tymoshenko, who on election night questioned the credibility of the leading exit-polls and presented an alternative exit-poll showing her in second place. 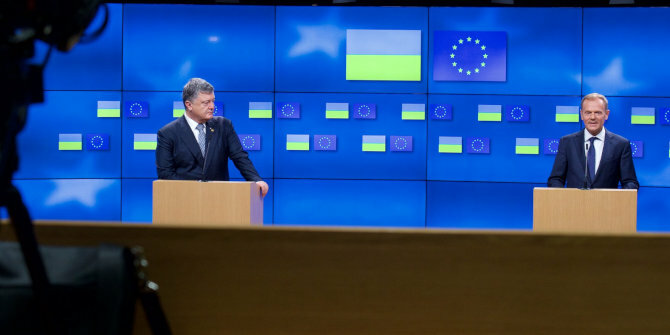 The election further cements Ukraine’s European integration course. The three leading candidates in the election have all explicitly spoken out in favour of seeking membership in the European Union and NATO. Yuriy Boyko and Oleksandr Vilkul, the two main candidates advocating for rapprochement with Russia, on the other hand, only received a combined sixteen percent of the vote. There are several reasons for their relatively lacklustre performance. One is that Russian aggression has shifted sentiments among parts of the electorate in the South and East of Ukraine that traditionally have voted for ‘pro-Russian’ candidates and parties. Another reason is that roughly one third of this electorate no longer votes in Ukrainian elections because they are in Russia-occupied Crimea or the Russia-controlled “People’s Republics” in the East. The outcome of the second round is open. Zelensky won the first round of the election with a programme that does not contain many details and that was likely unknown to most of his voters. He will face more scrutiny in the remaining weeks before the second round. There will be pressure on Zelensky to participate in televised debates with Poroshenko and when he does, his political ignorance will show. There is widespread concern that if Zelensky wins the election, oligarchic interests could exploit his lack of experience and Russia could ‘test’ the new President by escalating the conflict in the East. Because of such concerns, many Ukrainians may yet prefer the relative stability and predictability of a second Poroshenko term. Still, having received almost twice as many votes as Poroshenko, the mostly likely outcome of the second round is a Zelensky presidency. How this will turn out is anyone’s guess. Whether Poroshenko or Zelensky is President over the next five years, however, may matter less than many people think. Since independence, Ukraine has alternated between a version of executive-legislative relations that favours presidential power and one that results in a balance of powers between the President and the Parliament. Given that the balance of powers between the President and the Parliament was restored following the 2013-2014 Euromaidan Revolution, the President now relies on parliamentary support to push through their policy agenda. The Verkhovna Rada, Ukraine’s national parliament, will continue to serve as a serious check on presidential power. Poroshenko’s party, Solidarity, is in a minority governing coalition of which the other party and many individual MPs seem reluctant to be a part, and it is unlikely that Solidarity will expand its seat share in the parliamentary elections in October. Zelensky and his team have only recently founded their political party, People’s Servant, named after their hit sitcom, with the goal to participate in the upcoming parliamentary election. After the election, the People’s Servant faction will be just one of a range of factions in the Parliament, with which the party would have to form a coalition. The President of Ukraine is also checked by the international community and a strong civil society. Since the Euromaidan Revolution, the government has been more susceptible to pressure from civil society. Ukrainian civil society actors engage in advocacy in conjunction with international partners and in this way sometimes have considerable influence over legislation and policies. The Ukrainian government depends on the trust of international financial institutions and the political support of foreign governments. In recent years, Ukraine’s international partners have at times played a crucial role in persuading the government to adopt or implement reforms, including most notably in the area of anti-corruption. Whoever is the President of Ukraine in the coming years will not be able to escape external pressure. In pointing out that Ukraine may very well elect a comedian with no political experience as its next President, media reports about the election have insinuated that the country’s democracy is feckless and immature. The importance of social media in elections and the sudden rise of a political outsider, however, are common for many democracies today, including in Europe. The real takeaway from the first round of the election is that it has been more open and fair than any previous election in the country, strengthening Ukraine’s status as a European democracy. Max Bader is a Lecturer at Leiden University with expertise on Russia and Eurasia.